Icelandic chamber pop group Of Monsters and Men broke onto the international music scene in 2011, just a year after winning their country's nationwide battle-of-the-band competition Musiktilraunir. 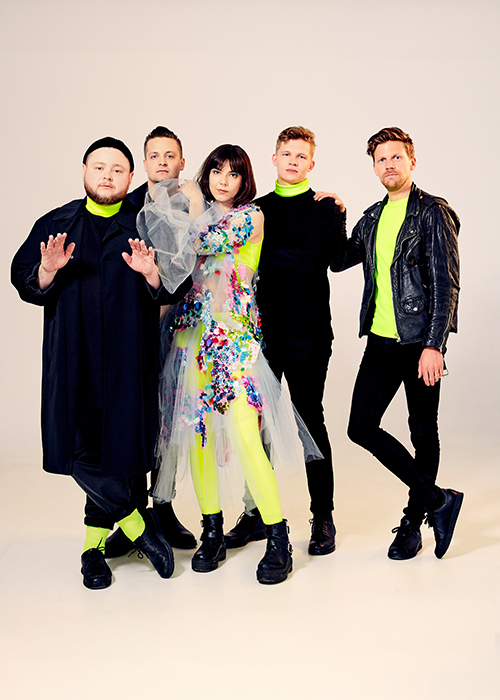 Hailed as "the new Arcade Fire" in Rolling Stone magazine, the band's original lineup comprised singer/guitarists Nanna Bryndís Hilmarsdóttir and Ragnar Þórhallsson, guitarist Brynjar Leifsson, keyboardist Árni Guðjónsson, bass player Kristján Páll Kristjánsson, and drummer Arnar Rósenkranz Hilmarsson. Their debut album, My Head Is an Animal, was released in Iceland by Record Records in the fall of 2011. Its infectious first single, "Little Talks," saw worldwide success, and the band signed with Universal Music Group. An EP titled Into the Woods was issued soon after, and an international release of their debut followed in 2012 with a slightly different track list. The album became an international hit, charting throughout Western Europe and Australasia, and hitting number six on the U.S. Billboard 200. Tours and major festival appearances including Lollapalooza, Bonnaroo, and Glastonbury followed, as did television appearances such as the U.S.'s Late Night with Jimmy Fallon a month after the album's release and the U.K.'s The Graham Norton Show later in the year. Around this time, Guðjónsson left the band, and in the spring of 2013 the quintet won a coveted spot on the U.S.'s Saturday Night Live. The same year, their song "Silhouettes" appeared on the soundtrack for The Hunger Games: Catching Fire and the group began work on its second album. Co-produced by Rich Costey (Interpol, Muse, Kimbra) and recorded in Iceland and Los Angeles in 2014 and early 2015, Beneath the Skin appeared in June 2015, debuting at three on the Billboard charts.